The Urban Historic Centre of Cienfuegos is the best extant example of 19th-century urban planning principles in the Americas. The city was founded in 1819. Its homogenic architecture and streetplan was influenced by the Spanish Enlightenment and French colonists. The latter were invited here by request of the Spanish crown, which wanted to attract white settlers after the Haitian rebellion of 1791. The main public square Parque José Marti (former Square of Arms) contains a band shell, the Worker’s Arch and fountains, and is surrounded by monumental buildings like the Cathedral, City Hall and Theatre. The streets are of a neo-classic straight and symmetric design, with use of porches and arcades. Cienfuegos, situated on a Bay, is one of the prime seaports of Cuba. Cienfuegos is the most elegant and prosperous Cuban city that I visited on my trip. Especially its Punta Gorda neighbourhood – palm trees everywhere, wide streets, comfortable looking houses, a marina. It could be Florida. A very pleasant place to wander about. I also used the city buses, which at western standards are so incredibly cheap that I even wasn’t able to change money so small. My casa owner ended up just giving me some coins. A ride costs 20 centavos in Moneda Nacional, that’s about 0,007 EUR. The WHS area comprises the historic centre, and then mainly the Parque José Marti, the central square. It has monumental buildings on all sides. These include the iconic City Hall (former Governal Palace and now home to the regional administration), which unfortunately you cannot enter. Next to it is the Provincial Museum, worth a look for its quirkyness but like most museums in Cuba not with a strong collection or presentation. There’s the cathedral, undergoing restorations at the moment and looking much like a construction site. The fine blue turret of the Palacio de Ferrer. The center of the square holds the obligate statues and the quite small Worker’s Arch (a triumphal arch) and a band shell. The best sight here undoubtedly is the Teatro Tomas Terry, located at the north side of the square. It opened in 1895. From the outside it is just one of those big neoclassical buildings that Cienfuegos has in abundance. Its interior is so lovely however. Together with Matanzas' old pharmacy, I think this is the best individual historic monument in Cuba. It has great period furnishings, like lamps, cast-iron grills, painted ceiling and folding seats. Our visit was slightly shortened by the car breaking, but with some luck, we found local mechanic, who fixed everything in 10 minutes. The elegant core of the city is concentrated around main square – Parque Jose Marti. The architecture was inspired by the founders – French emigrants. The city is not that old, it was only founded in 1819 and was influenced by the neoclassic ideas of the settlers. The key attractions are Teatro Tomas Terry (1889) with good external mosaics, Arco de Triunfo (1902), Catedral de la Purisima Concepcion Church (1869), Palacio de Gobierno (1917) and Casa de la Cultura Benjamin Duarte or Palacio de Ferrer (1918). For 1 cuc we climbed the latter one, with dominating light blue cupola and iron staircase. There good views over the city, with some usual for Cuba a bit dilapidating impression. Despite the buildings constructed in various periods, together they create quite balanced and harmonic ensemble. We also made a stroll along key shopping and pedestrian street El Bulevar. 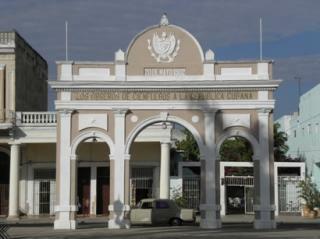 We liked Cienfuegos, as it is not usual colonial town, but a later example of neoclassical architecture. 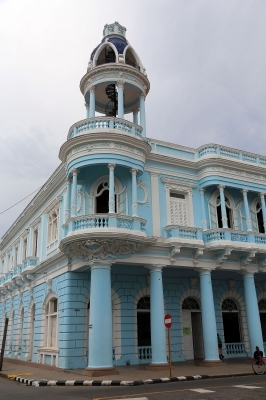 The Urban Historic Centre of Cienfuegos is amazing. The buildings are all being repaired and restored after the hurricane last year. One of my favorite places down there is the Tomas Terry cafe, which has musical groups performing almost nightly. Although, this place is geared more for tourists than some of the other places in Cienfuegos. On Thursday nights there is a Rumba performance for tourists to experience here as well. Also, there are day activities all the time throughout Cienfuegos. You can ask what is going on where and when at the House of Culture, which is also in this square. You can definitely see the French influence in this square (Parque Jose Marti). I recommend that you take a walk down the streets leading out of this square and explore the city. While it is a positive thing that the facades of buildings are being restored, I think it is important to also focus on the restoration of the inside of buildings. There are so many houses a few streets over, on the Prado, that are historically important, architecturally, that need to be restored and preserved as well. I was not a tourist in Cienfuegos, I was a student. Because of this, I was able to explore a lot of the city. I would recommend seeing more than just this square but this part of town is definitely worth seeing. Cathedrals: Catedral de la Purisima Concepción. The two-towered, neo-classical building was finished in 1869 and consecrated as cathedral in 1904. Named after individual people: The original colony was called "Fernandina de Jagua" after the nearby Castilla de Jagua built by Spain in 1738. It (and the province within which it stands) was later renamed after Cuba's Spanish Captain General (Governor) Don José Cienfuego who had granted the right of settlement to the French-Louisianan émigré Louis de Clouet. NB: some books incorrectly state that it was named after one of Castro's fellow revolutionaries Camilo Cienfuegos!